"The Weather Clock said knife o'clock, so I chained Dad up in the shed." I had such a great time again at the Lakes International Comic Art Festival in Kendal. 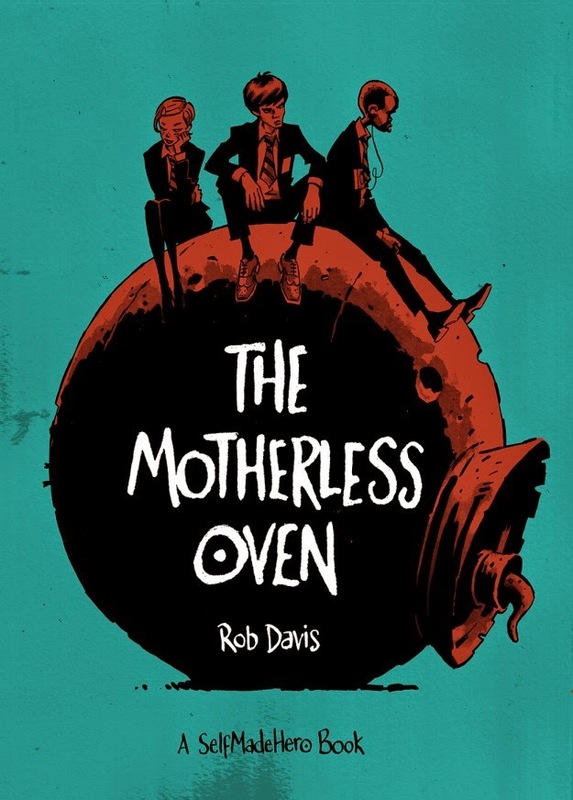 One of the events that I attended was by Rob Davis 'The Motherless Oven' book launch. I heard him talk about his book in a relaxed and casual manner, but by the end of the event I still had no idea really what the story was about. However, this was perhaps partly due to me looking around the Council Chambers, playing with the microphone and also taking in the monochrome frenzy of images projected onto a screen. All of these probably played a large part in my distraction! After the event, I was very intrigued to plunge into the story and images, so clutching my character sketch prize I went home to read it with post haste. Now I've read it twice and I love it even more. I still can't really tell you what the book is about, but what I can tell you is why I liked it. To me that is as important when I'm reviewing a book, so these are my thoughts . . . . . . 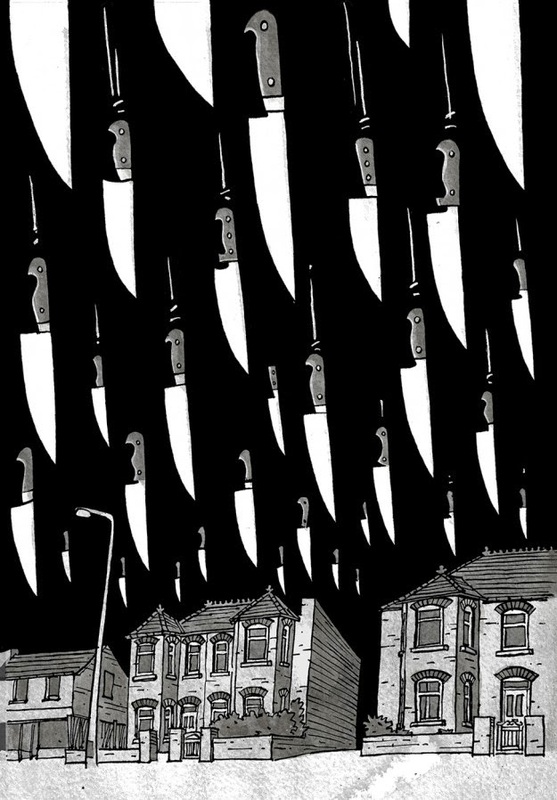 The first thing that I loved was that it was 100% crazy - in fact it was raining knives (see illustration below). It's such a surreal fantasy that has been pulled from the hidden depths of Rob's imagination. It is a whirlpool of memoirs from his childhood with strong connections to his past and present. The narrative picks up on this and writes an alternate future that may require some reflection and perhaps a couple of reads, so that it can mature in your brain. We are living in a world of Scarper Lee where parents don't make children, children make parents. Scarper's father is a wind-powered brass construction whilst his mother is a bakelite hairdryer. These lines strike a chord with me; they indicate an unusual beauty through their words. 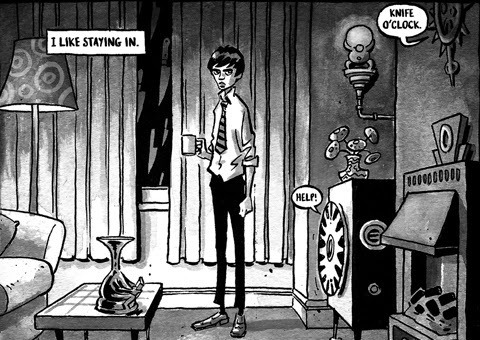 The story has a twisted melancholic feel which is reflected in the black and white illustrations. It’s also a world without birthdays, only deathdays, and Scarper's deathday is fast approaching. With just three weeks left to live, Scarper is forced from his routine and strikes out into the unknown—where relationships are tested and authority challenged. Graphically, this book is very special. 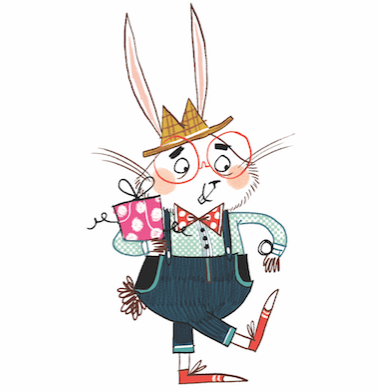 Each illustration is very well executed and really takes you in to the world of the characters. It delivers a unique and enhancing strangeness that washes over the reader. Literally, it is puzzling, captivating, but also highly original. Once you have read the last page it will leave you asking: what has just happened here? Chaos ensues on every page, but if you look closer you may find some kind of order within a dream-like state. I can guarantee that it will have made you smile from ear to ear. Very cool teenagers will relate to this story in some places, whilst the older generation should feel it through their DNA. No heroes, no villains, but a world in a monochrome bubble full of teenage angst and a school-like rebellion that replicates some very real human interaction. This is a story full of metaphors and a play on words that beats it's own heart. I loved both the story and the visual experience right down to the unresolved ending. Hopefully, this should make a great start to another superb book.